Rea & Associates, Inc. has a long heritage of supporting the communities we work in. Many of our team members volunteer thousands of hours to organizations that they are passionate about. Just a few of these groups include the American Heart Association, Junior Achievement, YMCAs, crisis centers and shelters, Goodwill, Flying Horse Farms, Project Learn, Share-A-Christmas and the United Way. Firmwide, our team members participate in an annual “Help Can Hunger” food drive each fall, where members of each office compete to bring in the most canned food items for their local food pantry for the holidays. This friendly competition consistently raises literally tons and tons of food for the needy. Rea staff members also participate in the annual FETCH! event (formerly Accounting For Kids Day), presented each November by members of the Ohio Society of CPAs. Accountants and team members lead students in an interactive game about which encourages them to make smart financial decisions and become savvy consumers and business leaders. View the firm’s most recent Community Impact Report. 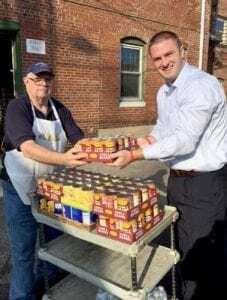 Scott Moyer, CPA, a principal at Rea & Associates, delivers a food donation to the Eastside Community Ministry Food Pantry in Zanesville, Ohio, during the firm’s Help Can Hunger event. Rea’s Zanesville office collected more than 760 pounds of food to be donated to the local nonprofit organization.